He of the Hand and the Eye, Vecna, the sorcerer turned Lich turned God of Secrets and Magic. The great bane of Greyhawk. What I love about Vecna, first and foremost, is his name. It sounds menacing, you get a good idea as it rolls across your tongue that you shouldn't even be saying it. Its...foreboding. Then you have his Hand and his Eye. Two terrible artifacts that require the seeker to sacrifice those parts to acquire their power. Not only do you throw your players a quest (or 2), but a price that must be paid. Its...tantalizing. Let's mix in the fact that he keeps coming back. What's better than a god as your ultimate enemyt? A dead god, who you have to prevent from returning to the Prime Material Plane. Does it get any better than that? That's a challenge to test the mettle of your heroes. Wait, at that point he's an undead god! Its...malevolent. And don't forget Kas (the Bloody-Handed), his Vampire sidekick, who betray's him and provides us with another artifact, the Sword of Kas. A vile, intelligent weapon that is rumored to be dread Vecna's only weakness. This is classic stuff, how does this not inspire a whole campaign? How...wicked. 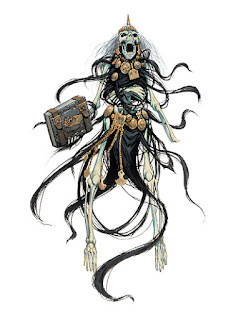 Oh, and don't forget Vecna authored the Book of Vile Darkness. If you can't get inspiration from any of these things, there is something wrong with you. Vecna is quintessential DnD. How...inspiring.